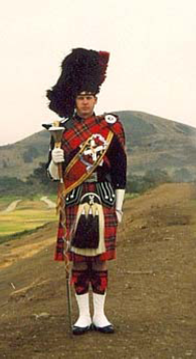 When it comes to Massed Bands performances at highland games, anything is possible…although you are not likely to see the precision of execution demonstrated at the Beijing Olympics. More often than not, instructions are given on the fly. A good rule of thumb is, follow the person in front of you and do what they do, when they do it, and where. Massed Bands is generally performed at noon and again at 5 PM. Bands are usually required to perform at both if they want to receive their travel money, so in that respect we are being paid to perform. A Band who is the first competitor in the afternoon is frequently excused from the noon performance. If there is a Drum Major, they may or may not use standard regimental signals and commands. If they don’t, be prepared for anything. If they do, here are some of the more common commands. ATTENTION is the position from which all other positions or movements derive. All movements retain some attributes of the ATTENTION position. 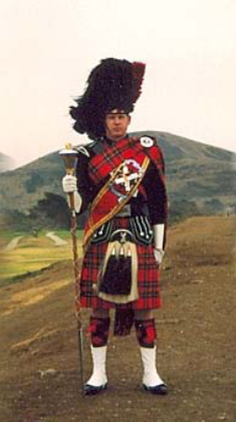 For Pipers, ATTENTION means the right elbow is tight against the body. The fist is closed and the thumb points downward along an imaginary pant/kilt seam. Heels are together, feet are at a 30 degree angle, and weight is evenly distributed. The pipes are tucked up under the left arm. As the name implies, this is where the pipes are moved from under the arm to the shoulder. We will practice “Pipes Up” and “Pipes Down” to help you understand the movements. Watch your spacing as compared to the piper in front of you and to your right. The term “by the right” is in reference to how bands are spaced. Individuals in the front rank except those on the extreme right side turn their heads to the right and raise their right arms parallel to the ground in order to get the proper distance from each other. Every subsequent line lines up in the same manner. Individuals begin marching, always setting off on the left foot. The initial pace follows immediately after the command is given, and is a reduced pace of 20 inches, compared with a full marching pace of 30 inches. The command is usually preceded by the command "By the left (right, centre), depending on which file (left, right or centre) they are take their dressing from, not which foot they use to step off on. Counter marching can be a royal pain if the bands are not sufficiently spaced. Counter marching is marching in the opposite direction between the existing rows…if that makes sense. The signal for the counter march is illustrated below. Where the Drum Major turns and marches in the opposite direction is the point at which every line is supposed to turn. The turn is to the right. The front line is responsible for ensuring alignment after the turn. Every subsequent line makes the necessary spacing adjustments based on the piper in front of them and to their right. When all else fails, follow the person in front of you and do what they do. Mark Time is marching in place. The signal (illustrated below) can be difficult to see. When the Drum Major stops, the bands are supposed to stop and continue marching and playing in place. When the mace comes fully down, usually at the end of a phrase, the bands stop marching but continue to play. Stop marching on your right foot. Heels are together, feet are at a 30 degree angle, and weight is evenly distributed. The opposite of Pipes Up; the movements are performed in reverse order. You are at attention at this point - the right elbow is tight against the body. The fist is closed and the thumb points downward along an imaginary seam. Heels are together, feet are at a 30 degree angle, and weight is evenly distributed. The pipes are tucked up under the left arm. Individuals move the left foot so that both feet are shoulder width apart, bringing the right arm behind so the hand is in the small of the back, palm out. Pipes are still tucked under the arm. 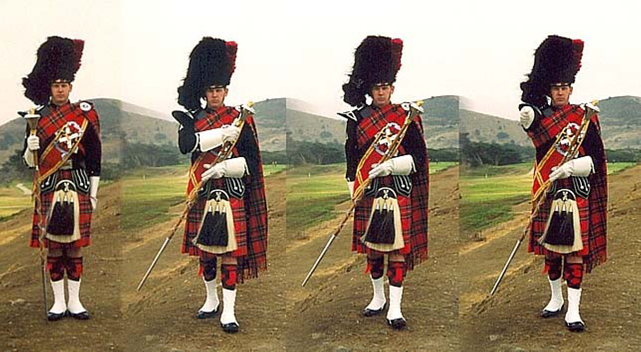 The Drum Major stands as illustrated below. Individuals are permitted light movement, but are not allowed to talk or move their feet. You can hold your pipes and stand however is comfortable. There are additional signals for wheels, and circles but this should get you through the majority of Massed Bands performances.